Since NutriAdmin is sending the email, the email has to always originate from "no-reply@nutriadmin.com", NutriAdmin cannot directly send the email from your own address since it does not have access to your email account. 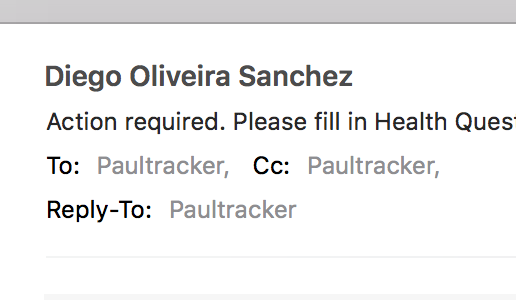 It is possible however to change the name your client sees for this "from" field in the email. Below are a couple of screenshots showing how this would look like on Apple Mail from the client's perspective. Other mail providers will look similar. Step 1: Click on Settings on the left-side menu. Step 2: Click on the Branding tab. Step 3: Scroll down in the page and select use my own name or use "NutriAdmin no-reply". There are advantages and disadvantages of choosing either name. If you use your own name, clients will have an easier time identifying your name and messages in their inbox. On the other hand, if a client may mistakenly reply to nutriadmin insted of to you. Since a client will see your name, no-reply@nutriadmin.com, they may assume that your email is "no-reply@nutriadmin.com" and send a message there. In any case, when a client hits the reply button in an email, replies will always go to you. Errors can only happen when the client manually types the email address. 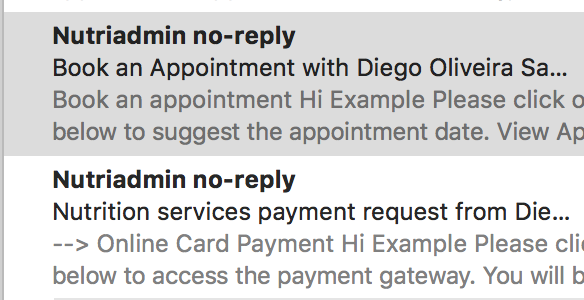 Finally, no-reply@nutriadmin.com is an email account only used to send automated emails. This email address is not monitored, and any incoming emails are deleted, along with any potential attachments. When someone emails no-reply@nutriadmin.com they will receive an automatic response saying that they have reached the wrong inbox. Taking the above into consideration you can choose wheter you prefer to use your own name or NutriAdmin no-reply.